The sessions will take place at the Keefe Community Center, 11 Pine St., Hamden, from 3-8 p.m. every Thursday, starting Feb. 2 and running through April 13. 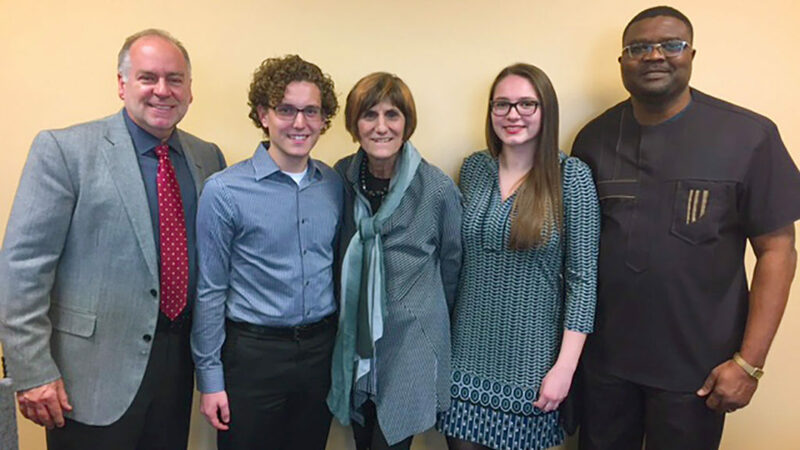 From left: Matthew Maron, assistant teaching professor of accounting and VITA program coordinator at Quinnipiac University, Quinnipiac junior accounting major Daniel Giordano, U.S. Rep. Rosa DeLauro, Quinnipiac junior accounting major Frances Nemeth, and Nelson Alino, chair and associate professor of accounting at Quinnipiac, were among those who attended a Jan. 27 press conference at the Keefe Center in recognition of Earned Income Tax Credit Awareness Day. Photo by John Pettit of Quinnipiac University. Quinnipiac University accounting students will offer free income tax return preparation services at a series of volunteer income tax assistance (VITA) sessions during this year’s tax season. The services are available to taxpayers with annual household incomes of $54,000 or less. The sessions will take place at the Keefe Community Center, 11 Pine St., Hamden, from 3-8 p.m. every Thursday, starting Feb. 2 and running through April 13. There will be no session on March 16, while the students are on spring break. Those who are interested can just walk in; no appointments are necessary. Maron and Nick Misenti, assistant teaching professor of business law at Quinnipiac, will review each tax return before it is e-filed. Quinnipiac’s VITA program is part of the United Way of Greater New Haven’s VITA coalition. For more information, please contact Maron at [email protected] or 203-582-7623.